Curious about downsizing? I’m answering all of your questions today! I often get asked about the decision that Corey and I made back in 2017 to sell our home and downsize to a smaller one in order to get out of debt. Many people want to know if we think it was worth it, if we like living in a smaller home, and if we’d do it again. Now that we’ve lived here for over a year, I thought it might be worth it to sit down and share a few of my thoughts about downsizing. I know many of you have either done it or are considering doing it, so I want to share our experience. First of all, if you don’t know our story, allow me to give you a brief overview. If you want the entire story, I’ll link all of the posts below. Almost two years ago now, Corey and I made the tough decision to prepare our first home to be put on the market so that we could move into a smaller home. We weren’t finished with that house, and we weren’t quite ready to move on from it. 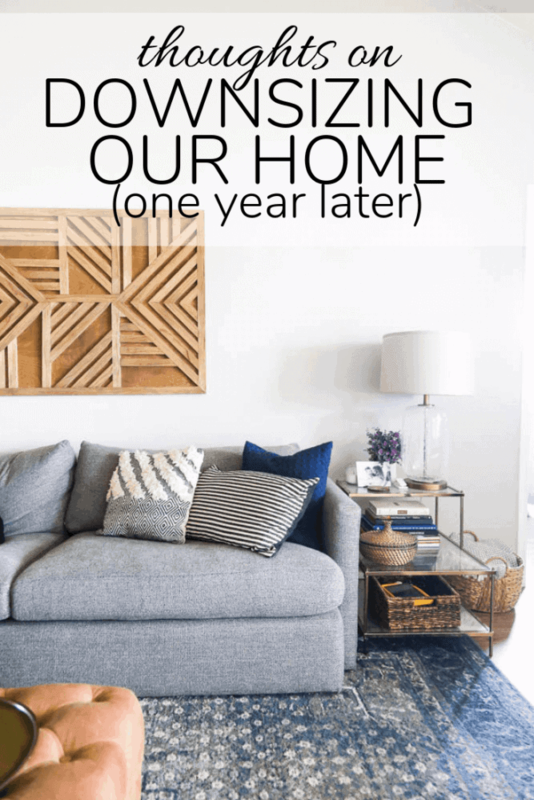 However, we were on a journey to pay of all of our debt, and we knew that the fastest way to knock it all out would be to move into a smaller home. We sold our home, made a significant profit, and used the majority of it to pay off every last cent of debt we had (aside from the mortgage on our current home). I can’t even begin to describe to you the relief we felt when we hit “submit” on that very last payment and knew that we were free from debt. We have no intention of ever going back to having any sort of credit card debt, though this summer we did use financing to purchase a used car to use as our main family car. We often get asked about if we feel like we made the right decision, if we miss our old house, and if we’d do anything differently. So, let’s chat about it, shall we? Here’s the post where we announced our decision to move and explained our story. We shared some of our thoughts on the process while we were in the middle of it in this post. After we settled into our new home, we shared this wrap up and answered some FAQs. Now, let’s jump into some of the questions we get most often. Do you like living in a smaller home? Our current home is about 1,100 square feet and to be completely transparent, we don’t love it. The home itself is fine and it has served us well, but with two kids and two dogs (one of them being a 70 pound Doberman), it’s just not enough house for us. I feel like if I don’t keep everything completely clean at all times, the house feels like a disaster zone, but it’s hard to find ample storage space for all of the paraphernalia that comes with having small children. That being said, I have absolutely nothing against small homes. I think they can be beautiful and I know many families who live in homes just as small as ours or smaller, and they love it. It’s just not right for us long-term. We aren’t sure quite yet. If Corey had his way, we’d be looking for a new home right now, but that’s just not practical. Our original plan was to live here for 3-5 years, then keep this home as a rental property. However, we’ve researched a bit more and learned that it really wouldn’t net us enough profit to be worth it, so our new plan is to simply sell this house when we’re ready to leave and explore the idea of getting a rental property somewhere down the line. We know that we’ll be in this home for at least another year or so, but after that we’re open to begin looking for something a little more permanent for our family. This home was never meant to be a long-term place for us, so we have no need to stay any longer than necessary. I cannot overstate this enough: It was one-thousand percent worth it. Even though neither Corey or I are super happy with this home, and even though our five-year-old regularly tells us that he misses our old house because he had more room to play, and even though I feel like pulling my hair out when I trip over the dog for the twentieth time because she’s too big to navigate this small house, IT IS WORTH IT. We take being debt-free very seriously, and we really felt like God was leading us to take this path. It’s not for everyone, but there were so many very clear signs that this is what we were supposed to do, and we haven’t regretted it for a single second. Living in this smaller home has allowed us to put ourselves in a much better financial position, and we wouldn’t trade that for the world. It’s also been really fun to live in a home that we know we won’t be in for a long time, because it’s given us the freedom to take a few more risks and just have fun with the design. 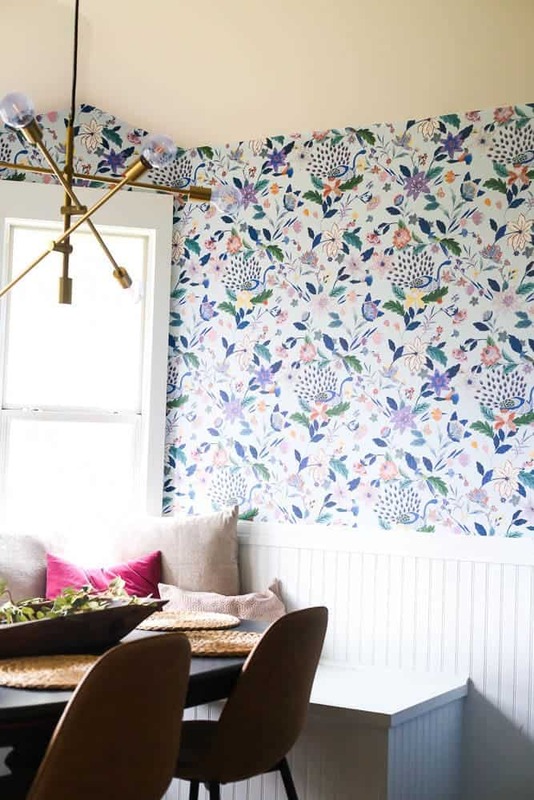 I might have been nervous to put up crazy-bold wallpaper in a home that I was going to be in forever, and I might have chickened out of painting our fireplace black – but since we know we don’t have to live with the decisions that we’re making for more than a few years, it’s allowing us to let loose and play around a bit. We’re learning so much about what we like and what we don’t, and we’re getting to try out some new skills along the way. I’ve heard from many of you who are thinking about moving or are preparing to move into a smaller home, and when you have kids it can be an overwhelming idea. Built-in storage is your best friend. We’ve been shocked at how much larger and more functional our home feels with the addition of built-in pieces of furniture. We’ve added a bay window bench, a built-in bed for our son, and floating shelves in the living room. 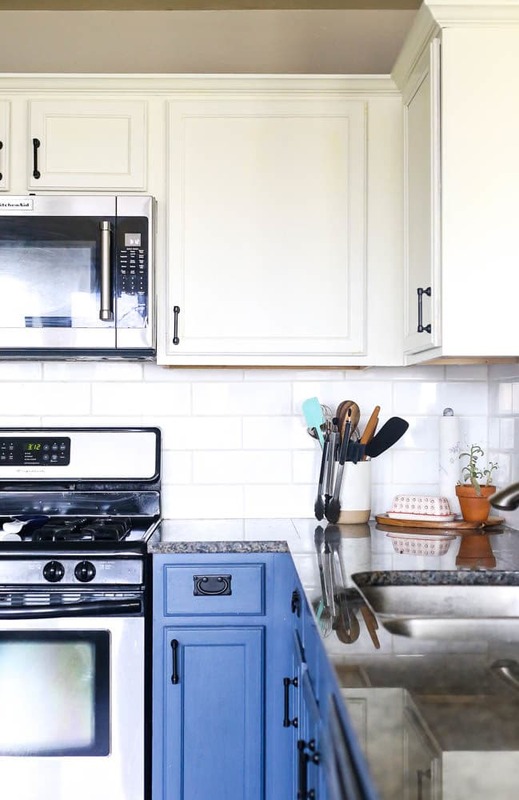 All of these touches make the home feel more like us, but they also pack in a ton of function that makes this tiny house feel a little more special. Purge, purge, purge! We’ve lived in this house for over a year and we’re still working to let go of unnecessary clutter and pare down our belongings. If you need some help getting started, you can always join in on the decluttering challenge we’re doing right now! It’s making a big difference in our home already. Don’t be afraid of bold choices. You might be worried that using dark, moody colors or making a bold design decision will make your home feel even smaller. It won’t! Often, small spaces actually benefit from these types of designs because it makes the space feel cozier and more welcoming. If you’re too safe with your choices, all you will be able to notice is how small the room is, not how beautifully it is designed. So go ahead and use that dark wall color or crazy patterned tile. Repeat after me: a place for everything. That silly little phrase that you’ve heard all your life really is key when it comes to living in a small home. Designate a space for every single thing that you own and then commit to actually keeping it there. Your home will feel infinitely larger when it’s kept (mostly) clean, and you’ll be amazed at how much of a difference it makes to just keep the space tidy. Here are a few of my tips for simple habits to adopt that will help you keep your home cleaner on a day-to-day basis. Finally, my last tip for fully embracing small-home-living is to find ways to maximize every inch of space that you do have. I’m constantly looking for creative storage solutions (I have so many baskets in this house it’s silly), and when I notice that something is consistently driving me crazy – like my son’s Play-Doh constantly on the dining room table – I look for a quick and easy way to fix it. We’ve instituted family rules about cleaning up after yourself (Jackson can’t move on from one activity until he’s cleaned up whatever he’s doing), we’ve utilized hidden space for storage (I added drawers in the linen closet for Play-Doh and we even store seldom-used things in the utility closet), and we’ve moved things around as many times as necessary to land on that perfect arrangement that doesn’t make the room feel cramped. It takes a lot of trial and error along with some creative thinking, but if you start by identifying the specific things about your home that are bothering you, you can work to find solutions from there. In a perfect world, we’d move sometime early next year into a home that we can confidently call our “forever home”. We’d love something with a large lot, lots of space for our family, and tons of potential. But, there’s no way to know exactly what’s going to happen. For now, we’re just going to keep doing our thing and improving this home, and see where life takes us. Hopefully this is helpful to any of you who have been curious about our experience downsizing and wondering if it’s right for you! While this transition hasn’t been the easiest thing we’ve ever done, Corey and I both wholeheartedly agree that this was the best decision for our family and we’d do it again without a moment of hesitation. I’d love to hear about your home. Do you feel like you have enough space? Have you ever tried downsizing before? I’m really surprised you made this move to be debt-free and then chose to finance an automobile. I’d love for you to talk about this more. Hi Brianne – Great question! It’s something we debated a LOT before landing on the decision to finance. When I was having my second son in August we knew we needed to replace my old Prius (it had nearly 200K miles and wasn’t large enough for 2 kids + groceries/errands) because it just wouldn’t work for our larger family. My husband drives an old truck that we paid cash for, and we considered paying cash for a car for me, but in the end we decided to place a priority on getting something just a little newer/nicer with less miles that we knew would be very reliable. We depend on our cars VERY much – nothing near us is walkable at all – so it’s not an option to be out a car. We wanted to be sure that the main family car was one that we could rely on for many years – and we plan to drive this one until it falls apart! It’s definitely an individual decision and wouldn’t be right for everyone, but we feel good about the decision we made and fully intend to pay the car off early – and then not replace it until we absolutely must.